A common misconception amongst nonbelievers is that Christianity and (what the world calls) feminism are mutually exclusive social forces. This official autobiography of an early 20th century British woman's solo journey to China as a missionary during the Sino-Japanese war proves the opposite. There's nothing clever or gender specific about courage. It's attractiveness lies in the sheer force of its will to overcome seemingly insurmountable odds. Aylward simply believed that God would guide her across Europe and Russia via rail alone, and without having practically any formal training and hardly any church support, she left London one day with her Bible, passport, some pocket change and a few traveling items to follow her heart's call to be a missionary in China. 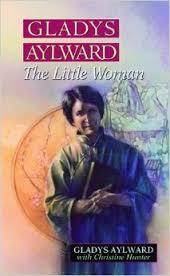 If you're looking for smart poetic writing in a story, Gladys Aylward: The Little Woman is not for you. But, if you want true grit, honest adventure and historic drama verified, than read this British woman's inspiring journey and how she spent a lifetime preaching and teaching the gospel and taking care of thousands of orphans during one of the most brutal eras in recent history. Aylward taught herself fluent Chinese and worked in a rural province amongst the dirt poor needy and deprived victims and refugees of the war to rescue as many as she could from physical and spiritual suffering alike. Her evangelizing gifts budded in London first where she says she "went into public houses and rescued girls the sailors had made drunk." Gladys took them back to her hostel and on Sundays took them to a Gospel Mission. Church history, as well as Scripture, testifies that the Lord tests those who he has great plans for in small ways before leading them on. For example, David first bravely fought Goliath and then became King of Israel's armies, leading them from battle to victorious battle for the sake of the Kingdom. What started out as a ministry in her native England turned into an international lifetime service of giving hope and succor to some of Asia's most neediest during a pivotal time in China's social and cultural history. As much as Aylward despised godless Communism, she was able to take advantage of the new regime's anti foot binding laws that intended to free females from a centuries old tortuous custom. She landed a job as a "foot inspector" and was given a couple of soldiers and told to go into the most remote locations to enforce the new law (but only if they agreed to let her spread the gospel of Christ). Her duties made her less popular than a tax collector but she persisted and led many to freedom, at one time even guiding 100 orphans over mountains and through dangerous battlefield zones in order to secure their safety from the Japanese. Aylward briefly returned to England after the war and was dismayed at the lack of vigor in the modern Christian church. She said that it was easier "to preach to the heathen than to motivate saints with feet of clay." After some interactions there and in Ireland, she eventually returned to Taiwan and received honors from the Free China government where she eventually died and was buried. The book is a riveting read and you can hear this remarkable woman's voice on tape in this YouTube clip below. Mother Theresa may have gotten more press, but Aylward gets more glory in God's book, I'll bet.